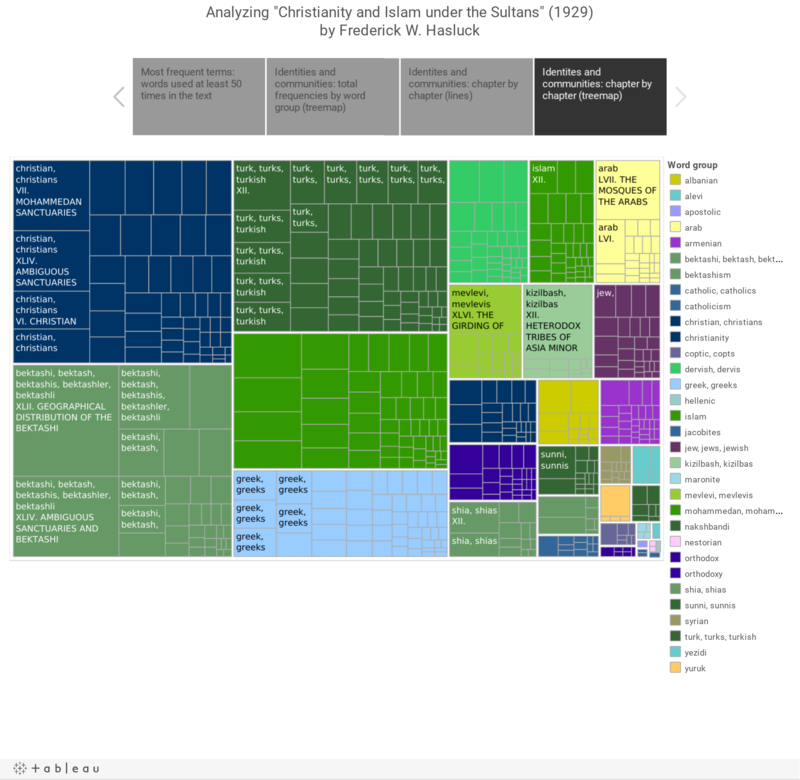 This section presents text analysis visualizations highlighting patterns and relations in Frederick Hasluck’s “Christianity and Islam under the Sultans” based on the number of instances of certain words (frequency) and associated words that tend to appear next to each other (collocation Collocation is defined as "the act or result of placing or arranging together; specifically : a noticeable arrangement or conjoining of linguistic elements (as words)".). 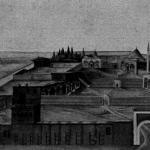 “Christianity and Islam under the Sultans” consists of 293,014 words and 26,657 unique word forms. The ten most frequent words are ‘saint‘ (672), ‘bektashi‘ (633), ‘christian‘ (581), ‘tomb‘ (545), ‘tekke Tekkes: dervish monasteries, religious communities (built complexes), religious complexes. Source: Getty Art & Architecture Thesaurus Online.‘(532), ‘church‘ (495), ‘saints‘ (418), ‘turkish‘ (404), ‘below‘ (402) and ‘near‘ (400). The visualization below shows most frequent terms (appearing at least 50 times) and frequency patterns of certain ethnic and religious terms across the chapters of “Christianity and Islam under the Sultans”. Stopword lists have been applied to exclude common English words (“of”, “the”, “and”). 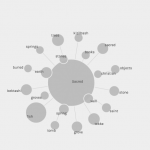 Having generated word frequencies distributed across semantic domains (e.g. saints and figures, community and identity terms, landscape and the built environment) we can zoom in to certain concepts, terms and keywords in search of deeper links and relations. We generated lists of collocates Collocation is defined as "the act or result of placing or arranging together; specifically : a noticeable arrangement or conjoining of linguistic elements (as words)". for certain terms in order to analyze them closer, in their immediate context, as they appear in the text. We applied stopword lists to exclude common English words (“of”, “the”, “and”) and highlight meaningful neighboring terms. The following visualizations show some of these terms as they tend to appear next to certain ‘neighbors’ or as part of repeating pairs or phrases. SAINTS: “GEORGE”, “KHIDR” and “ELIAS”. Relation of key terms” (“George“, “Khidr“, “Elias“) to “neighbor” terms most frequently appearing in proximity (at least 5 times). Node size shows frequency. Uze controls to zoom in / zoom out and increase / decrease the number of nodes shown in the network. Read the “Saints we share: George, Khidr and Elias” micro-essay to learn more about the correlation of these saints. Relation of key terms “stone”, “water” and “tree” to “neighbors” that appear at least twice in proximity to the key term. Node size shows frequency. Uze controls to zoom in / zoom out and increase / decrease the number of nodes shown in the network.. To learn more about landscape sanctity markers read: Venerated Landscapes:’Natural Sanctuaries’ and Sacred Space Markers in F.W. Hascluck’s ‘Christianity and Islam‘. Relation of key terms (‘Bektashi‘, ‘Kizilbash‘) to ‘neighbors’, most frequently appearing in proximity. Node size shows frequency. Uze controls to zoom in / zoom out and increase / decrease the number of nodes shown in the network. To learn more about tracing identity in “Christianity and Islam” read Visualizing Identity in Hasluck’s text.